Contemporary architectural design and support, bridging the gap with lightweight, high-strength technology for true green architecture design. Large sliding doors are a component in contemporary architecture and design that can create challenges in manufacturing, transportation, installation and ongoing maintenance in steel buildings. Traditional warehouse sliding doors are acceptable upon installation but require maintenance over time due to operation failure. 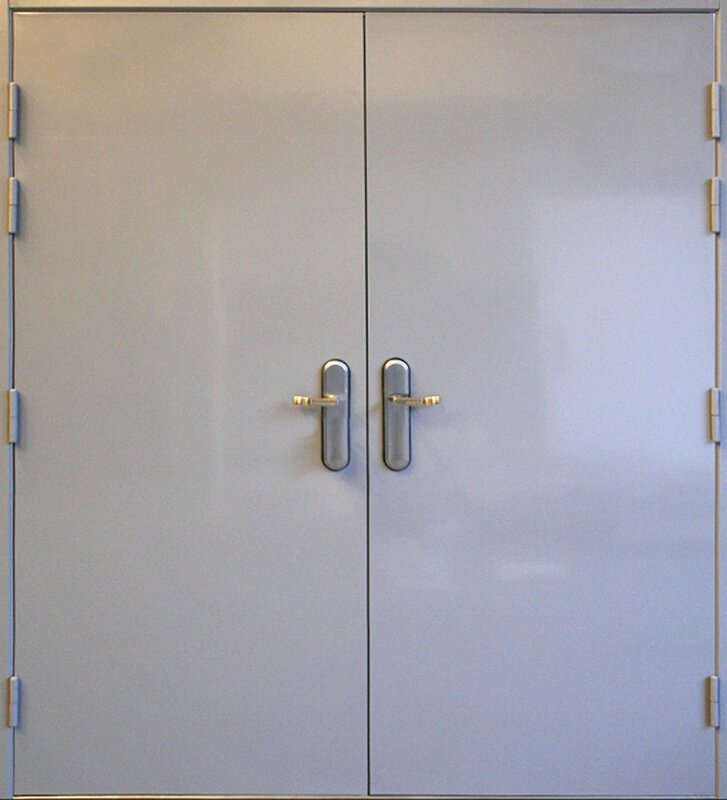 The fact is, large sliding doors – the types of doors found on steel buildings – are destined for failure due to warping and twisting or failure of the structure or sliding door hardware. Dealing with large sliding doors of considerable size poses a number of problems. From the get-go the manufacturing of a really large door will incur added expenses and they charges keep getting more expensive along the way. 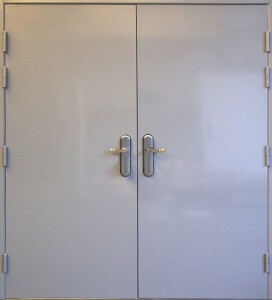 Large sliding doors are expensive to make, handle and ship. They also require extra manpower and equipment to load, offload, transport, install and maintain over time. Our large door specialists have been solving the problems associated with large sliding doors for years. In fact, we can deliver high precision large sliding doors that are lighter in weight, stronger than steel and guaranteed not to warp, twist or fail for 50 years! When a large door is extremely large, the shipping costs can be the most expensive piece of the large door’s cost due to the sheer size of the enormous door(s) and can be many times the cost of manufacturing the large sliding door. Some doors are so large that they cannot be shipped by conventional transfer methods (though some end users, like the military, have more transfer methods available). Our large door team helps you to design and build a large sliding door (up to 50 ft wide) that is built of the highest precision, lightest weight, strongest material in modular components that can be flat-packed and shipped to your location for assembly on site. Our modular sliding doors are so high precision, that you cannot even detect the seams following assembly and painting. The patented insulated material that we use to build our large sliding doors with weighs a fraction of the weight of traditional building materials and is stronger than steel (660 PSI) allowing us to build a non-warping large sliding door that can be guaranteed not to fail for 50 years. The modular sliding door components are much easier to crate, ship, transport, handle, install, do not require any additional maintenance and saves on the additional cost of heavy duty hardware due to the lighter weight of the overall sliding door(s) following assembly. 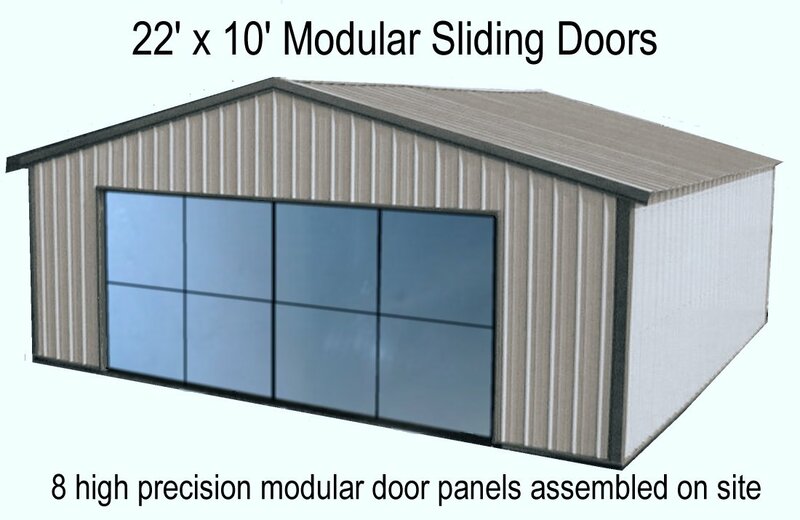 You can find these large modular architectural sliding doors in service in just about anything requiring a large opening and access point, like a steel building, warehouse or airplane hangar. 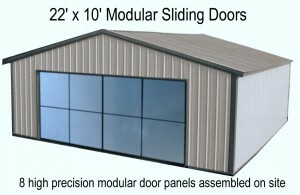 When it comes to airplane hangar doors, these modular outdoor sliding doors make the best sliding hangar doors. 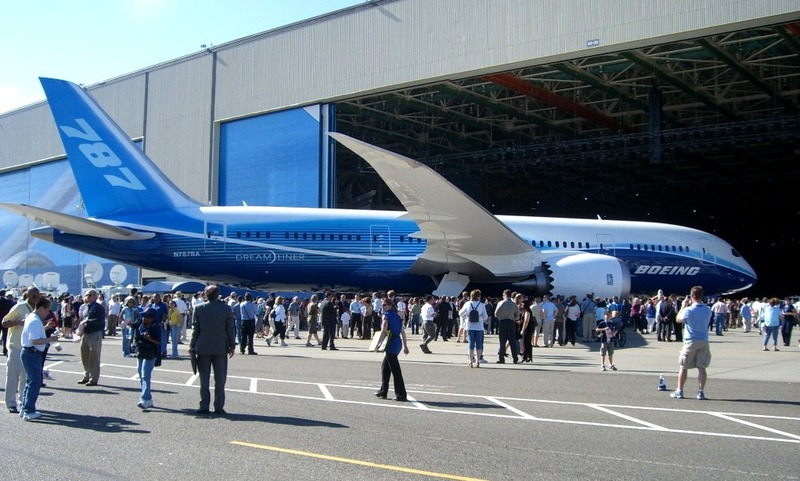 An insulated no fail airplane hangar door offers added strength, protection and security than other large hangar doors. You need not be limited to your large sliding door’s exterior surface material. 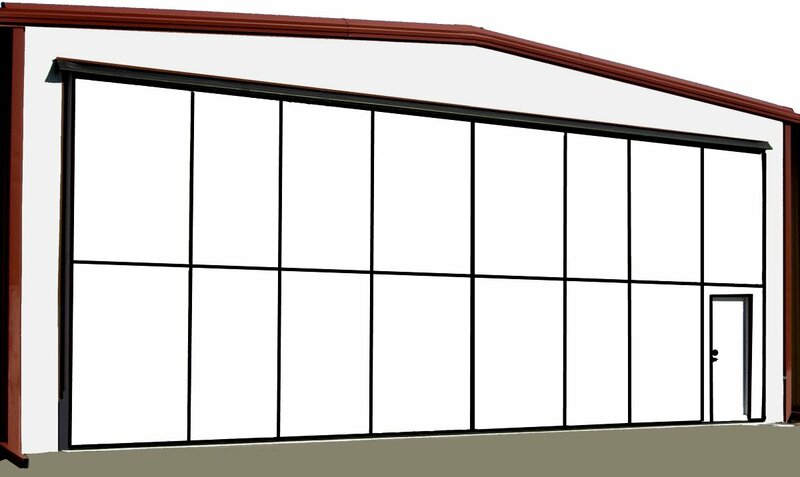 We design and build your large modular sliding door solution to your specifications, so your door could be made of any natural wood grain, brick, concrete, diamond plate steel, fiberglass, FRP, glass, Kevlar, LVL, MDF, plastic or any other flat building material desired (and/or available). Contact us to see how our guaranteed modular large sliding door solutions ban best benefit your project. Specify A Large Wood Door?